and those for long-distance neutron monitoring in the 3rd building (right). 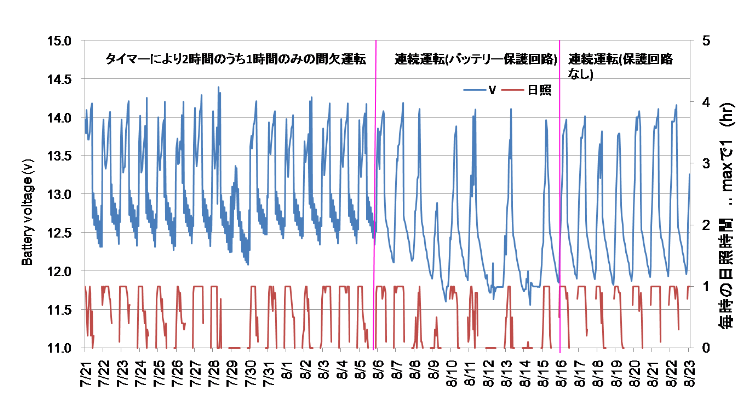 We have developed cosmic radiation monitoring system in the Mount Fuji Weather Station, the highest place in Japan, to estimate cosmic radiation exposure at aviation altitude in relation to solar activity changes. For real-time, accurate dosimetry of cosmic radiation exposure, several advanced instruments for cosmic radiation measurements were installed in the Mt. Fuji Weather Station. The data were sent via two lines of long-distance wireless LAN to NIRS (Chiba, Japan) in real time. Measurements continued from July 12 to August 25, 2010, for about 44 days. The measured dose rates agreed well to an estimated value by model calculations. Also, from August 26, we started automatic monitoring of neutron dose using a extended energy neutron monitor with 24 portable batteries and a newly developed data logger having communication controlling functions. At the end of September, the system is working successfully. Now it is considered that a basic system for continuous cosmic-radiation monitoring at the summit of Mt.Fuji has been established. Based on this system, we are making a program to determine solar magnetic potential and aviation doses in real time. 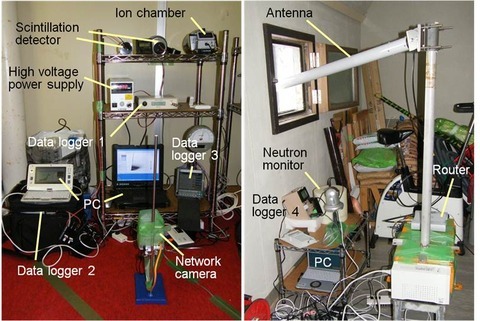 1) Hiroshi Yasuda、Kazuaki Yajima: Characterization of Radiation Instruments at the Summit of Mt. Fuji. Radiat. Meas. doi:10.1016/j.radmeas.2010.06.014, 2010. 2) Kazuaki Yajima、Hiroshi Yasuda: Measurement of cosmic-neutron energy spectrum at the summit of Mt. Fuji. Radiat. Meas. doi:10.1016/j.radmeas.2010.06.032, 2010. 3) Hiroshi Yasuda, Kazuaki Yajima et al. Effective dose measured with a life size human phantom in a low Earth orbit mission. 16th Solid State Dosimetry Conference, Sydney, 2010.9. 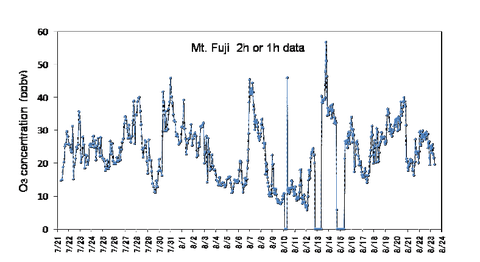 Climate change is not just about CO2, but microscopic particles (atmospheric aerosols) also play a major role. They regulate today’s climate either by interfering with solar and terrestrial radiation, or indirectly by acting as seeds of cloud (or cloud condensation nuclei) upon which water vapor condense onto. In short, without the aerosols, there will be no cloud (or rain). The “new particle formation” in the title literally refers to an event by which new particles are formed in the atmosphere through condensation of precursor gases. Such gases are often adsorbed on preexisting particles (e.g. in polluted environments) and there will be no net change in the number of particles. On the other hand, explosive blooms of tiny particles have been observed in rather clean environments. The condition or mechanism that triggers the new particle formation is still not very well understood, but attracted much attention as an important pathway for increasing the number of cloud condensation nuclei. This project aims at capturing the exact moment of new particle formation by monitoring the concentration of atmospheric ions (nanometer sized, 1/1,000,000 of millimeter) which mediate gases and particles. Unlike airborne measurements using aircrafts, the project takes full advantage of the summit of Mt. Fuji (3,776m) as a “monitoring tower” for continuously measuring rather clean air aloft. Since last year, joint French and Japanese team has been installing an ion counter at the summit during summer season. The 2010 campaign ended in an overall success with over one month’s worth of continuous data. Figure 1 shows the variation of negatively charged ion concentration in 5 August, 2010. 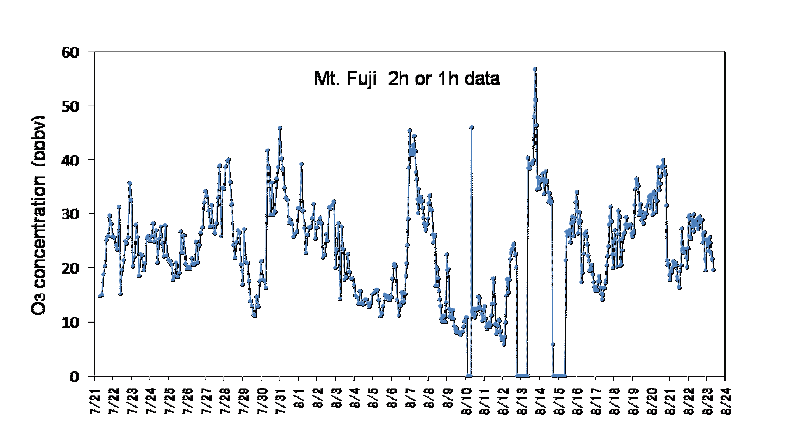 There was a drastic increase and growth of ions around 9:30LST lasting more than few hours. On this day, weather was fine at the summit and the ion growth pattern was completely different from that typically found during rain (Lenard effect*). This example strongly suggests that the new particle formation indeed took place at the site. We plan to compare with the meteorological parameters, trace gases and aerosol concentrations to analyze the condition of such event in more detail. *Lenard effect: phenomenon by which atmospheric ions are formed through bursting water droplets. Surface ozone monitoring without using commercial power supply was tested at the summit of Mt. Fuji. An ozone monitor was operated powered by photovoltaic cell and seal batteries with several operation scenarios. 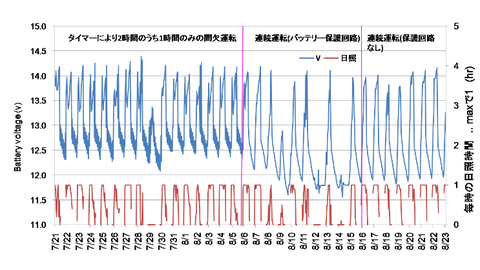 With the solar-powered system, time series of ozone concentration was successfully obtained during the summer campaign. Based on this result, additional apparatus and the improvement of the solar power system is to be designed for constructing the year-round ozone monitoring system in the near future.